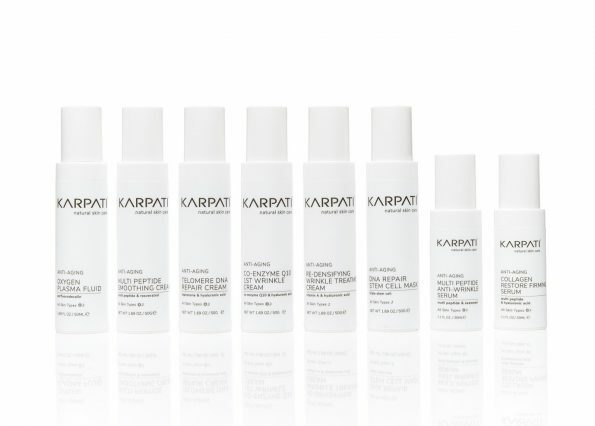 Karpati Natural Skincare belongs to the new generation of skincare. 100% Skin Friendly formulations based on a Marine Concept using natural, safe and effective ingredients. Having gained notoriety as a skincare expert with her KARPATI clinic, Eva has pioneered the Karpati Natural Skincare range of advanced and natural marine concept skincare with a promise of complete skin health. Drawing on her deep understanding of mineral rich marine based ingredients, the Karpati Natural Skincare collection combines potent nutrients and marine actives to transform the skin naturally. The Karpati Natural Skincare system facilitates healing at a deep level to prevent premature ageing of the skin, repairing and nurturing skin at the cellular level. Scientifically developed marine active ingredients stimulate cell regeneration, increase skin elasticity and assist in the removal of impurities to increase the resilience of the skin. The KARPATI promise is to produce true results naturally, restoring skin back to it’s optimum health. Transforming the skin gently over time reveals skin that is alive, hydrated, plump and revitalised. Karpati natural 100% skin friendly Marine Stem Cell Cleansing Milk removes all traces of makeup and impurities. The gentle hypoallergenic formula takes perfect care of the face and delicate eye area, assisting in the maintenance of clean and healthy skin. Ideal for all skin types, including sensitive and reactive skin, without the chemical nasties. Our #1 Bestseller! Enzyme Powder Cleanser ! Recommended for all skin types including the most delicate and sensitive skin. Specially formulated for daily use, this enzymatic powder cleanser stimulates skin renewal and removes all impurities and congestion without making the skin irritated or sensitive to sunlight. Powerful, gentle natural actives refine skin texture and radiance without irritation to allow pores to be ready for full hydration. 4 Expertise Eye Gel works to counteract sagging of the delicate eye area, reducing visible signs of fatigue. The gentle fragrance free gel formula absorbs easily to eradicate dark circles, puffiness and crow’s feet, lifting the eyelids for an alert and youthful appearance. Easy to use, this effective dark circle treatment contains a combination of peptides and natural ingredients to stimulate blood circulation and brighten the skin around the delicate eye area, reducing puffiness and dark circles whilst replenishing critical moisture levels to the skin around the eyes. Works as you sleep! Breathable, thin anti aging mask that provides complete repair to skin overnight. Triple Stem Cell Technology works three-fold to fight free radicals, protect skin and reduce visible ageing. Water-based actives radically stimulate skin vitality and boosts collagen for increased skin firmness and elasticity. Provides immediate hydration and smoothing for plumper, firmer skin. Peptide + Hydration = Ultimate Wrinkle Reduction! This advanced serum inhibits muscle contractions to restore your youthful appearance, supplness and elasticity. Oxygen Therapy ! Breathe new life into the skin. This lightweight fluid maintains skin, breathability and revitalizes the outer layers. Perfect for all skin types especially skin needing barrier protection strenghthening to outer layers! Fun Fact: Co-Enzyme Q10 is naturally present in the human body for the activation of cell function, producing energy for cells to grow and strengthen. A powerful anti-oxidant high potency improves skin elasticity for a more plump and youthful appearance. SOOTHE & PROTECT SENSITIVE SKIN!! Powerful peptides reinforce the skin’s barrier to defend and protect against environmental stressors. Natural calming actives instantly soothe and calm skin as the peptides strengthen and repair the outer layers.